Hello friends! Welcome to the third and (somewhat delayed) final installment of our three part series on assembling your first PCB prototype. 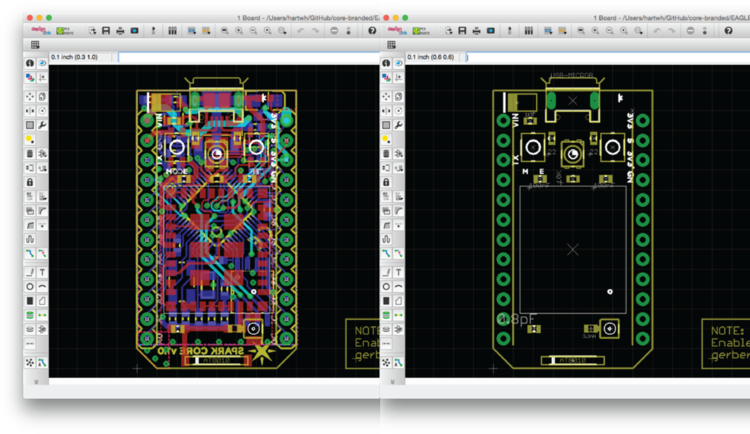 If you haven’t already, please take a quick glance over the previous two posts in the series to familiarize yourself with the digital and physical resources we’ll be using to assemble your first PCB prototype. In this post, I’m going to share some of the tips and tricks that I’ve learned throughout the last couple years that have helped make assembling hundreds of new PCB prototypes for Particle a bit easier. As I write this, I find myself realizing that, much like the routine you use to towel yourself off after a shower, PCB assembly techniques are rarely discussed in public forum despite being skills that engineers constantly practice and optimize. Here’s hoping that at least a few of these tips resonate with other experienced hackers out there, and that a few others are useful to those who still feel a little wet behind the ears (get it?!). Left. All layers. Right. Layers relevant to assembly. Much better. Those layers might have slightly different names in other CAD programs, but all PCB design tools will have controls for activating and deactivating these layers. Now the only problem is that some of the part value labels are way too big, some are way too small, and others are facing the wrong direction. That makes them difficult to read, and hard to follow. Let’s fix that. Step 2: “Smash” the labels. I know that sounds unnecessarily violent, but it’s what EAGLE calls separating the value label from the part so that it can be manipulated independently (moved, resized, etc.). To do this, click the “Smash” icon, which looks like a rectangle on top of a small IC. Then, immediately click the “Group” icon, which looks like a grey rectangle. Use the rectangle to select your entire PCB then right click. You should see an option that says “Smash: Group”. This will separate all part values from their associated components. Step 3: Resize. Follow a similar process to resize all the value labels by using the “Size” tool. The “Size” tool is located in a submenu of the “Change” tool, which is shaped like a wrench. Click “Change”, then “Size”, then the text size that best fits the scale of your PCB. Then, click the “Group” icon, select your entire PCB, right click, and select “Change: Group”. All the designators on your PCB should change to the appropriate size. Note: If you have text in your silkscreen (tPlace) layer, you might want to temporarily deactivate it while resizing the part labels to avoid accidentally modifying it. Step 4: Reorient. Now that the labels are the right size, click on the “Move” icon, which looks like a set of crosshairs. You should be able to move the label independently of of the part, and EAGLE will display a white line connecting the label to its corresponding part so you don’t lose track of the pairing as you reposition it. Right clicking will rotate the part label 90 degrees. If you’re having trouble getting the placement resolution you need, you can reduce the grid size under the “View > Grid” menu. Let your solder paste warm up a bit. The proper storage location for solder paste is a solder fridge (like a mini-fridge, except it’s best not to mix solder with food), so your paste is likely cold if you just pulled it out. Use an applicator to pull a little bit out of the solder container and deposit it onto your stencil. Allow it to sit for five minutes or so–it will become less viscous, and easier to spread through the holes in your stencil. Tape down your PCB. Take a piece of scotch tape, wrap it in a circle to make it omni-sticky, and tape the back of your PCB down to the table. This will prevent it from moving and sliding, allowing you to get a perfectly clean stencil release and solder deposition. Align the stencil. Make sure your stencil and PCB are oriented the same direction, and align the cutouts on your stencil with the solder pads of your PCB. If you built your stencil correctly, you should see only the shiny silver/gold of your PCB’s solder pads and none of the colored soldermask. A great way to align a large or complicated array of pads is to use the “Dive Bomber Technique”, a method introduced to me by Makerbot Founder Zach Hoeken during our days at HAX. Bring the stencil right up to your eyeball of choice and look at the pad on your PCB that corresponds to the cutout you’re looking through. Keeping the stencil close, lower your face down onto the correct pad, and make fine adjustments until the rest of the pads align. Boom. The infamous “Dive Bomber” technique. Spread the paste. Use your forearm or fingers to hold the stencil in place while you apply the paste. Apply firm, even pressure with the applicator, and spread the solder paste over the cutouts in the stencil. Try to minimize the number of passes while ensuring that each aperture gets enough attention–too little solder can lead to incomplete electrical connections, and too much can lead to electrical shorts during reflow. Remove the stencil. Removing the stencil is actually one of the most difficult parts of applying solder effectively. Use one of your hands to press the far edge of the solder stencil into the table and lift up on the near side of the stencil. By using the back edge of the stencil as a hinge, you avoid the wiggling and smearing that happens if you try and remove the stencil by lifting vertically. Since your PCB is taped down, it should release cleanly, leaving you a neat, even coat of solder on all of your pads. Creating a hinge with one of the stencil edges creates a much cleaner release than lifting up vertically. Clean your stencil. Whether your solder application is perfect or a complete mess, make sure you clean the stencil with isopropyl alcohol between solder applications. This will help ensure the apertures are clean and produce even, clean applications going forward. If your solder pads look like the photo below, you’ve successfully applied a great layer of solder paste to your PCB, and you’re ready to start placing components. Notice the even coverage solder coverage on all pads–enough that you can’t see the gold finish of the pads beneath, but not too much that the board will be at risk of developing shorts during reflow. This is the moment you’ve been waiting for–it’s time to hand-place your components. The best tool here is just a good pair of tweezers and a steady hand, but this is the overall strategy I use when assembling boards. Placing 0201 inductors onto a prototype of the Photon. Find good, direct light. There’s nothing worse than going half blind trying to read the microscopic orientation designators on small ICs (Integrated Circuits). Find yourself a good desk or table lamp, and shine it directly onto your working area. Keep components on white printer paper. Especially if you’re working with tiny 0402 or 0201 resistors and capacitors, you’ll find it much easier to visually identify the parts you’re placing if they’re resting on a contrasting background. BONUS FUNCTIONALITY! When you’re done placing that component onto your board, you can bend the paper into a “U” and return the spare parts to the bag or container you’re storing them in. One component at a time. Whether you’re assembling one board or one hundred, I strongly prefer to place one component value at a time. If you’ve got ten boards and each requires four 10K resistors, pull out forty resistors and finish that component value for all of the boards before moving onto the next component. Placing one component value at a time allows you to follow a repeatable placement pattern, get in a groove, and will help prevent against part confusion and placement mistakes. Start with the large or principle ICs that require very delicate placement like MCUs or Wi-Fi/Bluetooth modules. They’re easier to place without parts nearby, and require the most minor adjustments to get just right. Next, I place small passive components. They’re the most tedious part of the assembly process and tend to have the largest number of repeat placements. Place one component value at a time to avoid getting confused and making incorrect placements, and muscle through it. Lastly, I place connectors, medium-sized ICs, crystals, and LEDs. This is your victory lap–the end is in sight, and after placing all those capacitors, this part almost feels like fun! In general, you want to try to complete more difficult placements earlier in the assembly process to avoid situations where have large, complicated parts that need placement on pads surrounded by small passive components just waiting to be tipped, shifted, moved, or misaligned. Start in the morning. 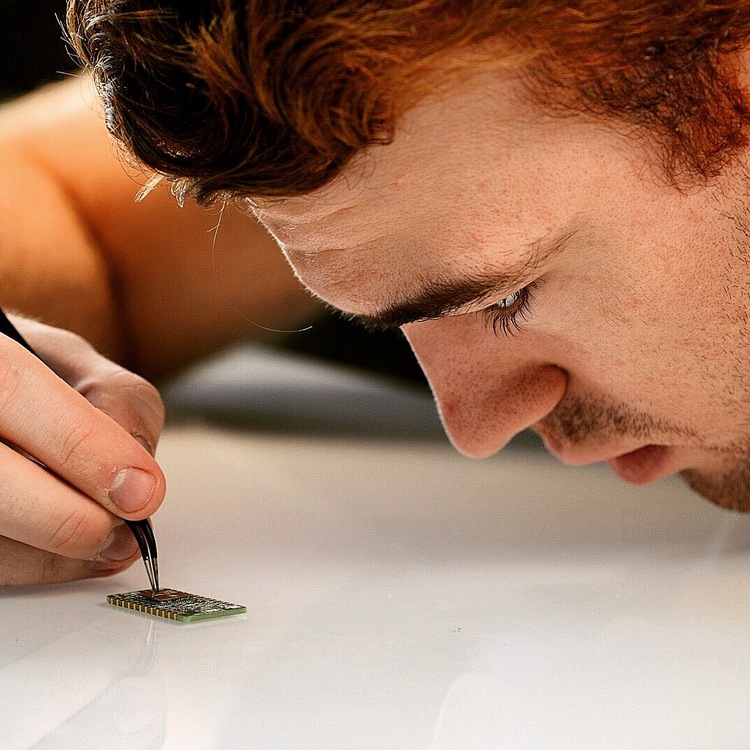 Assembling circuit boards takes tremendous amounts of mental and visual focus, and is much more difficult if you’re tired, stressed, or frustrated. If the day is winding down and you’ve still got boards to assemble, wait until tomorrow–you’ll make fewer mistakes and find the process far more agreeable. Take breaks. Especially if you’ve got hundreds or thousands of placements ahead of you, make sure to take occasional breaks. Mistakes or misplacements just lead to more work, so it’s important to be mentally engaged when you’ve got your tweezers in hand. 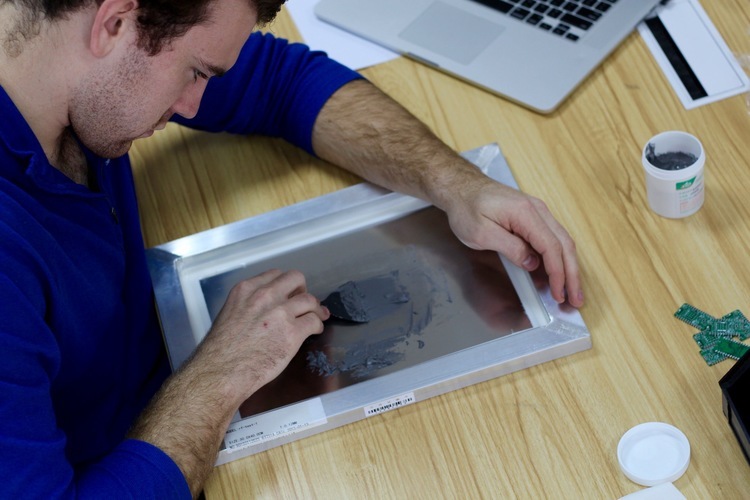 A desktop reflow oven that we purchased for Particle HQ in Shenzhen, China. Also available on Amazon! Reflow Oven. This is the simplest approach to reflowing your PCBs, since reflow ovens are purposefully designed to do exactly this. You can buy relatively cheap reflow ovens with quick shipping on Amazon. 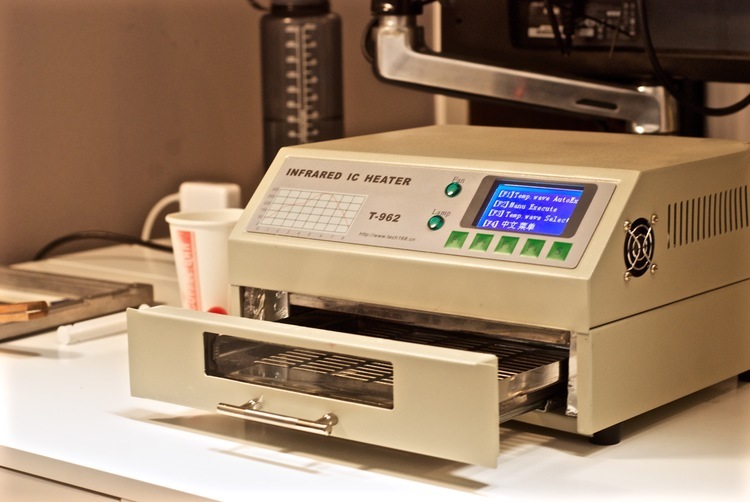 With these ovens, you simply place your PCBs in the drawer-style tray, select either a leaded or lead-free solder paste heating profile, and wait 7 minutes and 35 seconds. Note: Leaded solder paste is generally considered easier to work with than lead-free solder paste, but is more dangerous because of the lead content. We recommend lead-free solder paste–keep in mind that it will require a higher reflow temperature than leaded solder paste. Electric Griddle. For those of you who prefer pancakes to toast, you can use an electric griddle to reflow your boards. Drop your PCBs on the surface and crank up the heat. If the griddle is hot but your boards aren’t reflowing, you can fold a strip of aluminum into a “V” and place it on top of your PCB to form a little tent that traps and localizes the heat coming off of the hot surface. Once you see the solder reflow, turn off the griddle, and give it plenty of time to cool off (15-20 minutes) before removing the boards. Remember that, if you are using leaded solder paste, you will need to ventilate the area in which you are performing reflow. Most reflow ovens have attachments for ventilation tubing–use them! If you’re using a DIY solution, reflow your boards outside or use fans to circulate fresh air. No PCB is worth risking your health! Once your boards have had sufficient time to cool off from reflow, you can remove them and move to the next step–checking for reflow and assembly mistakes. 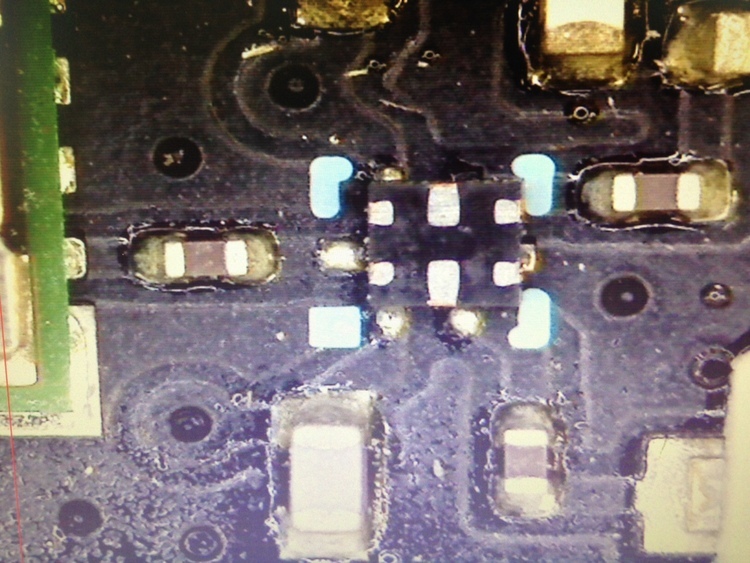 Notice the globs of silver-colored solder between the pins of the microcontroller in the center of the PCB. They are bad. If they connect pins routed to VCC and GND, it can fry and destroy the MCU. Photo credits. Find a multimeter, and set it into short detection mode. Set the probes on the power lines of your PCB (for DC-powered boards, select VCC and and GND). If the two probes are able to complete a circuit through the contact points, it will make a beeping noise. It should not beep–if it does, it means that your power and ground lines are connected; at best, your PCB will not work, and at worst it will fry your board/catch fire! After you’ve checked VCC and GND, select a few ground points on your PCB and use the multimeter to check that they are connected. Visually inspect the components. It’s important to visually check the solder connection of the components on your PCB after reflow has been completed. 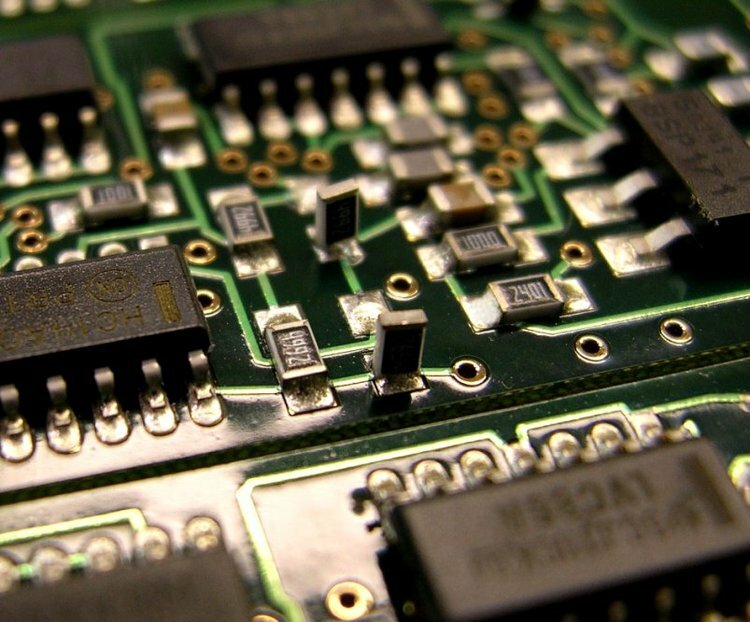 It’s amazing how many times a failed functional test can be traced back to a forgotten component or bad solder connection–issues that could be easily discovered with a scanning pair of eyes. Here are a couple examples of issues that can pop up behind the mysterious doors of your reflow oven; for a full list, check out this awesome article from Adafruit. This component, a small RF switch in a QFN package, was somehow soldered to this Photon prototype completely upside down and rotated 90 degrees. There were solder connections that reached up the sides of the part to the pads that kept it fixed in place, and the prototype could even (barely) connect wirelessly to the Internet! 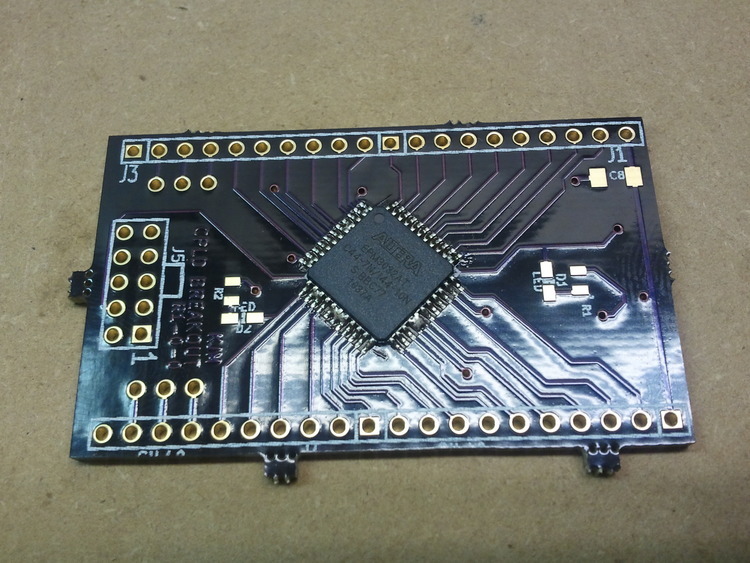 This is an example of a phenomena called tombstoning, in which a part finishes reflow soldered only on a single side and stands vertically over the PCB like a tombstone. This happens surprisingly frequently, maybe every 50-100 placements of a capacitor or resistor. Keep your eyes peeled! Photo credits. Functional test. At long last! 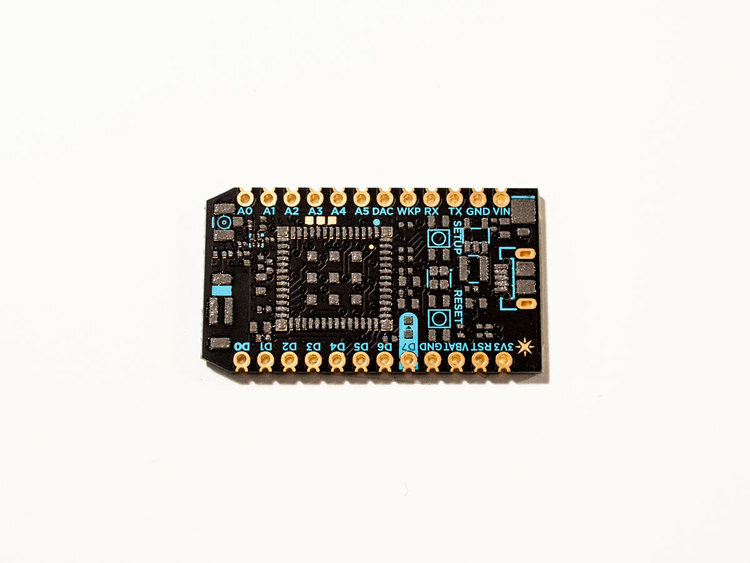 If there are no obvious visual issues with the components, and you’ve checked to make sure you’re not going to fry your board when you power it on, it’s time to see if it works! The functional evaluation will be different for every project, but in general, the best approach is to check every subsystem of your prototype (power, communications, wireless, displays, sensors) with deliberate and targeted tests. Start with the critical parts (MCUs), and move on peripheral sensors and systems. Wow, that was a lot of work. How do the pros do it? As soon as you get above 20-50 units, manual assembly starts to become extremely tedious. What about 1,000 units? 10,000? 100,000? 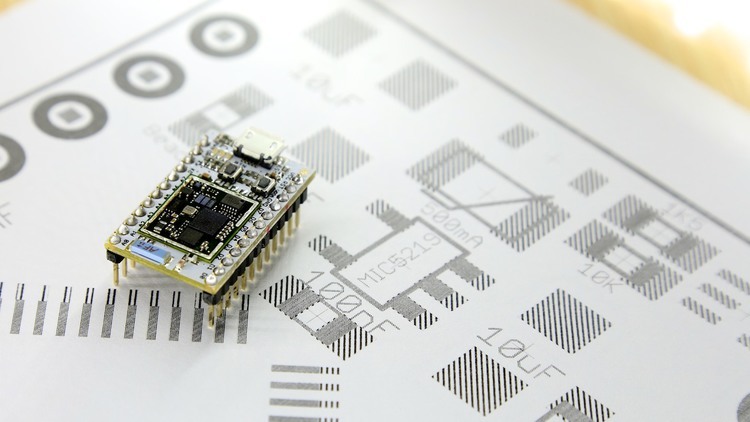 How do large contract manufacturers build PCBs? A picture is worth a thousand words, so I’ve linked to a little video we put together while building the Spark Core that gives an inside look at how all the work you did in this post is automated for mass production (sorry that it’s vertically oriented). If you liked this article and wish you had more assistance in the product development process, than be sure to check out our new engineering service, Particle Studios. Our Studios team has helped dozens of customers build their IoT products from concept to market, and they can help you too. 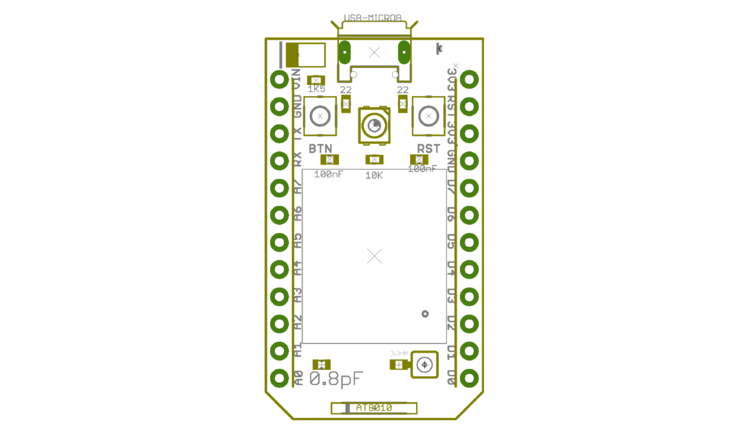 That wraps up our blog series about building your first PCB prototype! We sincerely hope that you learned a few things and enjoyed our commentary. Now that this mini-series is over, we’ll start to branch out into a wide range of topics aimed at helping you learn the skills you need to bring your ideas from concept to mass production. If you have any suggestions for topics we should cover, or burning questions that you want answered, please let us know in the comments section below. Editor’s Note: This article was originally published in 2015 and has been revamped and updated for accuracy.